The Chicago Audible podcast (albiet under a different name) launched before the 2015 season with a simple goal: give Chicago Bears fans an online community to hang out immediately after every game to discuss their Bears. Thus, as soon as every Bears game ends, another episode of The Chicago Audible begins. The show connects with audience members all over the globe and has a growing legion of die-hards who show up after each and every game. Over the years, the podcast has evolved from a once-per-week show to one that delivers multiple episodes per game week with full in-depth game previews. Additionally, the team has grown into a staff comprised of both podcast hosts and writers, which has made The Chicago Audible the place to get top-notch content created by fans. Will, Nick and Brandon at their second annual Bears game (10-22-17). The Chicago Audible podcast was founded by Will DeWitt, with Brandon Hazlett signing on soon thereafter to be the co-host. After the first season, Nicholas Moreno joined the crew to become the third host of the show, which completed the cast. Will is a 2017 Indiana University graduate who majored in sports journalism with a minor in sports marketing and management. He grew up going to games at Soldier Field and to countless training camp practices in nearby Bourbonnais, which fueled his passion towards founding The Chicago Audible. He is currently a marketing technologist at Rainmaker Digital. You can find him running the official Twitter @ChicagoAudible. Brandon is a 2017 Purdue University graduate who majored in communications. He currently is a Draftsman and Site Superintendent at Boyer Construction. His favorite all-time Bear is William “The Fridge” Perry and his favorite moment was Devin Hester’s Super Bowl return that happened to be on his birthday. Nick is a 2017 University of Iowa graduate who majored in journalism. He also is the host of a radio show, THE NFL Rundown, which takes place at one every Tuesday on 89.7 FM. He started watching the Bears because of his uncle, who took him to his first Bears game against the Saints in 2007. The Bears won (of course) and ever since that day he’s been a die-hard Bears fan. Even though he has been a fan a decade, Nick is all about Da Monsters of the Midway and that is evident by the enthusiasm he brings to show. Just like Brandon, his favorite Bears moment was when Devin Hester returned the opening kickoff of the Super Bowl for a touchdown. It was a surreal moment and one he will (like many of us) will never forget. In 2017, The Chicago Audible added a full-time designer to the team. Jordan is a 2014 Columbia College Chicago graduate who majored in Graphic Design. He led the show’s first major rebrand, as well as the unexpected second. Jordan is the designer of the show’s graphics, as well as some on the blog. Jordan has been a Bears fan all of his life but has yet been to a game in person. He enjoys the game from the couch or chair with good food and a Ginger Ale around. His favorite Chicago Bear memory was staying up late on a Monday night in 2006. Bears vs Cardinals. With an upset on the horizon, all three phases for the Chicago Bears made plays to put them in the lead and hold on for the win. That entire year was great and capped off with a Super Bowl appearance. The Chicago Audible team took another leap forward in January 2018 when six new writers came to the fold. Together, they consistently provide in-depth (and must-read) content. Their addition to the team transformed our site into a full-scale source of everything pertaining to the Chicago Bears. Andrew is a physical education teacher in the Chicago suburbs and a lifelong Bears fanatic. His all-time favorite Bear is Charles “Peanut” Tillman, and Andrew’s greatest Bears memory was on January 21, 2007, when the Bears beat the Saints in the NFC Championship game to advance to the Super Bowl. His favorite Chicago Bears memory is attending his first game at Soldier Field in the home opener against the Falcons in 2017 despite the end result being a loss. Follow Chris on Twitter at @cbocker32. Will is is currently a junior at Augustana College majoring in Journalism and English where he also plays on the varsity football team. His favorite Bears memory comes from the first game he attended in 2011 where the Bears trounced the Atlanta Falcons 30-12 on the 10th anniversary of 9/11. DeVante Tidwell is an itinerant speaker who has traveled the world communicating. 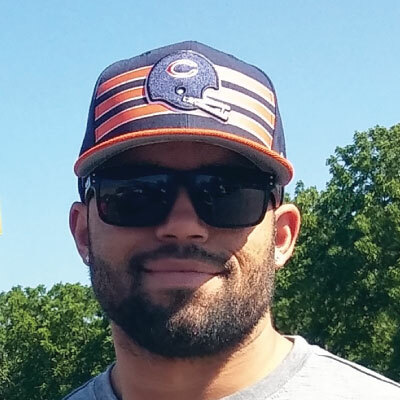 A devout Christian and Chicago Bears fan, DeVante joined the team in efforts to provide fans and the fan-curious alike with stories that compel and connect. His favorite Chicago Bears memory starts like this “With the second pick of the 2017 NFL draft, the Chicago Bears select …” Follow his Twitter @tidwelltalks for Bears coverage and raw opinion. Mark graduated from Arkansas State University, where he ran cross country and track for four years, in May 2017 with a Bachelors degree in Special Education. He is currently a resource math teacher at Jonesboro High School. His favorite Chicago Bear memory would have to be meeting Brian Urlacher in the bathroom of a hotel where he was dressing up as Santa for a charity event. He’s as nice of a guy off the field as he is a monster on it.